On Monday 20th February, Stilton gathered in the new Pavilion to honour the crew of B17 bomber Ten Horsepower, which crashed on Red Hill on 20th February 1944. It was over there! Don Darke points out the crash site on Red Hill. Don Darke, who was a small boy at the time, vividly recalled his memory of the doomed aircraft, as the remaining two crew members wrestled with its heavy controls in an icy blast through the shattered cockpit to try and land at Polebrook Airfield and save the life of their injured pilot. The southwest corner of the Pavilion looks out directly onto Red Hill, making it the perfect location for a memorial to the USAAF’s most decorated aircrew. Looking out, it is all too easy to visualise the awful sight of a B17 breaking up and cartwheeling to destruction. 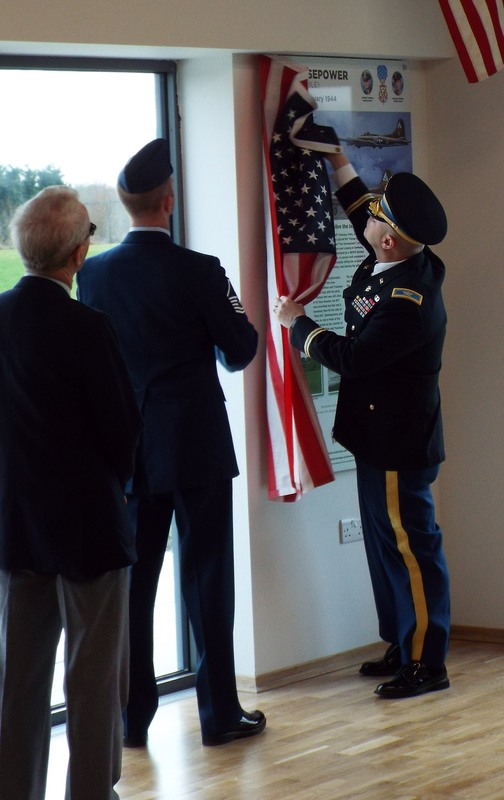 With guests of honour from the USAF, we stood in thought for the one-minute silence, which was ended by a particularly poignant Last Post, played by a trumpeter from the GB Home Guard Band. And then we watched and applauded as Colonel Bickerstaff, Commanding Officer of RAF Molesworth, formally unveiled the memorial plaque to his fallen countrymen. The story of Ten Horsepower might have remained forever untold but for the diligent research of author Rick School, who described the crew’s heroism in his book ‘Valor at Polebrook’. 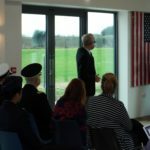 Sadly unable to be present for the ceremony, Rick sent the following personal tribute, read by Karen Munton, MD of Airfield Warehousing at Polebrook. Seventy-three years ago today, Lt. Nelson and his crew took off from Polebrook airfield in a B-17G called ‘Ten Horace Power’, named after her pilot, Lt. Horace Hopkins. Lt. Hopkins and his crew were on a 48-hour pass the morning of February 20, 1944, when Lt. Nelson and his crew took off. No one could have known as Ten Horsepower raced down the runway that by nightfall these ordinary men placed in extraordinary circumstances would become the highest decorated aircrew in the Eighth Air Force history. By day’s end, half of her crew would be gone and the remnants of Ten Horsepower along with two of her crew members would come to rest on Denton Hill. As you gaze upon Denton Hill, close your eyes and let your thoughts drift back seventy-three years. Can you feel how Walter Truemper and Archie Mathies may have felt? The exhaustion of flying their crippled B-17 for several hours back home while being attacked repeatedly by the Luftwaffe. Once over England, the relief they must have felt as they located Polebrook. 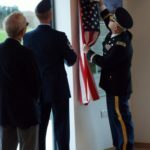 The feeling of grace that Joe Rex, Tom Sowell, Mac Hagbo, Carl Moore and Russell Robinson felt as they parachuted to the safety of their home base. The hope of help arriving, as Major Ledoux and Col. Romig flew alongside to guide them down. The desperation as they tried to line the big bomber up on the runway yet being unable to land. The anxiety as Walter relayed to Archie the order from Col. Romig to point the B-17 toward the sea and bail out, leaving their pilot, Lt. Nelson, alone to perish. Can you feel their resolve and pride as they refused to abandon Lt. Nelson? Listen. Listen. Can you hear the engines of Ten Horsepower straining as Archie struggled to control the aircraft as they approached Denton Hill? The desperate feeling of knowing what was about to happen, but the resolve and love for their pilot and friend, Lt. Nelson. Open your eyes and gaze upon Denton Hill. Seventy-three years have passed since that fateful day. The struggle for life was all too common, then, as our countries bore arms together in our quest for freedom. It is humbling that you and your countrymen, who gave so much and fought long before we arrived, honor the crew of Ten Horsepower today. I thank God for the men and women who have gone before us so that we may be free. Yes, seventy-three years ago today the lives of ten men were forever altered. We pay tribute to them and all who have answered the call to protect and defend our freedoms. May God bless our two countries and our armed forces, who willing go when called, so that we may be free.